hat’s the scariest thing happening just after Halloween? Is it the stomach-aches our children will have from eating too many sweet treats? No, it’s the Canada-China Foreign Investment Promotion and Protection Agreement (FIPA), which is slated to come into force on November 2nd, binding Canada for 31 years. Shockingly, the most significant trade agreement since NAFTA is set to automatically go into effect — without a single debate or vote in Parliament. Our political representatives have not even had the chance to say “Boo”. The deal was signed in secret by the Harper Government on September 9th, and quietly tabled in the House of Commons on Sept.26th. No press release to the Canadian media. No briefing to our MPs to announce the details. Just a clock ticking off the 21 sitting days until FIPA comes into force on Nov.2. But surely the Harper Government has protected Canada’s interests? Unfortunately, no. FIPA will delight the oil companies, but it places Canadian taxpayers at grave risk for billion dollar lawsuits launched by Chinese investors. And maddeningly, the lawsuits won’t take place in Canadian courts. They will be decided by a group of three international arbitrators, in secret, behind closed doors. No Canadian or International court appear able to overturn the tribunal’s decision. Why on earth is the Harper Government ceding control? How can it make sense to delegate our sovereignty to international arbitrators in secret tribunals? Isn’t anyone concerned about this? Osgoode Law Professor Gus Van Harten is. His expert opinion is that FIPA may be unconstitutional — the provinces have not agreed to it and Parliament has not been given the opportunity to debate it. Van Harten has called FIPA a straitjacket which will tie future government’s hands (for 31 years). Municipal, provincial, and federal governments could be prevented from enacting strict environmental and health regulations lest they be sued by Chinese investors who can claim that the rules have changed and adversely affect their investments. How convenient! Will Canada be ‘off the hook’ and blame China for preventing us from taking responsible action to reduce carbon emissions? Is this just one more sign of the Harper Government’s refusal to accept the reality of climate change and the need to make polluters pay? What is the solution? Council of Canadians suggests we look to Australia… Against a backdrop of investor challenges to public health measures (which opposed environmental regulations on coal-fired plants and health regulations on tobacco) they decided to opt out. They took a firm stand and refused to negotiate these radical investment protections in trade deals. They told big business to take out insurance rather than foist the financial risks onto Australian taxpayers. Great idea! Let’s do the same thing in Canada. But first we have to get Prime Minister Harper to allow a debate in Parliament. If you are concerned about FIPA, call the Prime Minister today. And then call your MP too! Demand that Parliament have the opportunity to debate and make changes to the treaty — or to rip it up and start over. As it is now written, FIPA is a bad deal that will haunt us for 31 years. Let’s do business with China – but let’s make sure it’s in Canada’s best interests. Call your MP and the PM! The Globe and Mail: Gus Van Harten – What if the Canada-China investment treaty is unconstitutional? Comment Policy: To be considered for publication, all comments must include the writer’s full name and a valid email for verification purposes. Please include your company affiliation if it is relevant. Only your name and the city/town where you live will be published. We reserve the right to edit comments for length and to remove profanity. Comments which are abusive or factually incorrect will not be published. Harper will not be able to put enough change in enough people’s jeans to be re-elected. Any trust I had in the government has withered away. This is the last straw. We send representatives to Parliament to look out for the best interests of Canadians. I am not against trading with other nations, but this deal gives China the upper hand over our sovereignty and our democratic right to enact laws to protect our resources and our environment as we see fit. China, a non-democratic country with an appalling human rights record, will hold all the aces. There is a word for a public official who would sell out his own country. I am appalled to hear of this!! It is not right that China have the upperhand on us as we do not know what this would mean and it seems that their would be no way out of it. It is crazy that the Prime Minister would not protect our country. Trade is good for everyone but not like this. what kind of gutless @#!!! * is running canada? perhaps we should all (as canadians) take up a collection and send harper on a one way ticket to china. how could anybody give away our oil sands in alberta. does the word traitor come to mind? it’s time someone stood up to china and said noooooooo!… mayby he could be voted in as prime minister of china… what a thought! Harper is a dictator..plain and simple. He is certainly not working in the best interest of Canadians. He must be stopped. 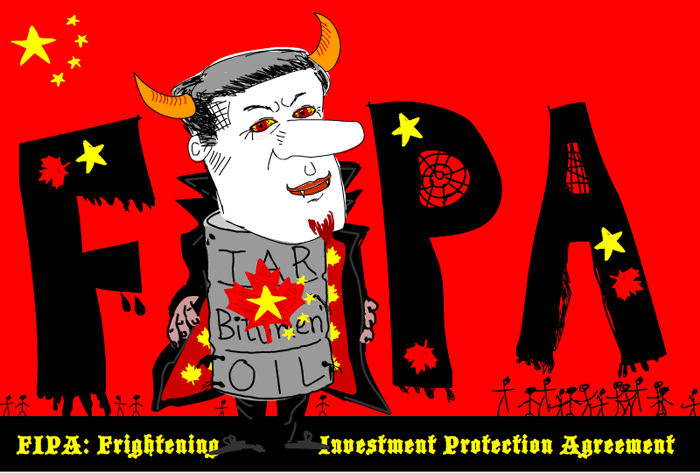 FIPA is a horrible deal that will only benefit shareholders and the Communist government of China. As a leader he is sneaky, devious and completely untrustworthy. Harper is appearing more like Obama with this very undemocratic and potentially unconstitutional stunt. At the very least i would expect a debate amongst our various democratically elected MP’s and provincial premiers. Arbitrary decisions like this are precipitating a gradual depletion of our sovereignty and ownership of Canadian natural resources. The same Globalistic policies exist under the Obama administration .The US and Canadian citizens are quickly losing their constitutional rights and freedoms due to tyranny like this. I am very grateful and thankful for the good 66 years of living in Canada as a Canadian citizen born and raised in Ontario. After reading this article, I am deeply concerned for the welfare of our future generation. Is there anyway we as Canadians can have this horrible agreement with China cancelled so that we as Canadians can have our freedom back? Thank you for your correspondence regarding the Canada-China FIPA. I appreciate the opportunity to hear about your concerns, and hope you will allow me an opportunity to respond and provide some context. Our Government is committed to creating the right conditions for Canadian businesses to compete globally. Canada’s Foreign Investment Promotion and Protection Agreement (FIPA) with China – the world’s second largest economy – will provide stronger protection for Canadians investing in China, and facilitate the creation of jobs and economic growth here at home. Our Government’s ambitious pro-trade plan is opening new doors for Canadian businesses in dynamic, high-growth markets like China, and our FIPA with China provides important benefits for Canadian investors. For businesses looking to set up in China, China cannot treat a Canadian company less favourably than they would any other foreign company looking to do the same. Fundamentally, this investment treaty will help protect the interests of Canadians. Creating a secure, predictable environment for Canadian investors is why, since 2006, our Government has concluded or brought into force FIPAs with 14 countries, and are actively negotiating with 12 others. The Canada-China FIPA is very similar to the other FIPAs that Canada is a party to. It contains all of the core substantive obligations that are standard in our other FIPAs. Our Conservative Government has introduced an unprecedented process for putting Canadian international treaties to the scrutiny of the House of Commons. In 2008, our Government announced that treaties between Canada and other states or entities, and which are considered to be governed by public international law, will be tabled in the House of Commons. Accordingly, the Canada-China FIPA was tabled in the House of Commons on September 26, 2012. This reflects our government’s commitment to transparency and accountability. With regards to investor-state dispute settlement, it is Canada’s long-standing policy to permit public access to such proceedings. Canada’s FIPA with China is no different. As we do with all other investor-to-state disputes, this FIPA allows Canada to make all documents submitted to an arbitral tribunal available to the public. All decisions of the tribunal will be made public. Ultimately, access to international arbitration will provide Canadian investors with the confidence that comes from recourse to an independent, international body to adjudicate any disputes. It is also important to note that under this treaty, both Canada and China have the right to regulate in the public interest. Chinese investors in Canada must obey the laws and regulations of Canada just as any Canadian investor must. At the same time, Chinese investment in Canada will continue to be subject to the Investment Canada Act for both the net benefit test for acquisitions above the applicable threshold and for national security concerns with respect to any investment. Decisions by Canada under the Investment Canada Act are excluded from challenge under the provisions of the FIPA. We’ve been clear that Canada wants to continue to expand its relationship with China, but we want to see it expand in a way that produces clear benefits for both sides. By ensuring greater protection against discriminatory and arbitrary practices, and enhancing predictability of a market’s policy framework, this FIPA will allow Canadians to invest in China with greater confidence.